The 50th annual Design Automation Conference (DAC) in Austin Texas is a landmark event. It is remarkable to think that engineers have been using computer-aided design for electronic systems for more than half a century now. In honor of DAC’s 50th anniversary, there is a small museum in the front of the show with memorabilia (pronounced “swag”) spanning the five-decade history of the conference. Among the T-shirts, coffee mugs, backpacks, and other era-appropriate giveaways, there are photo scrapbooks of years past and samples of conference proceedings. 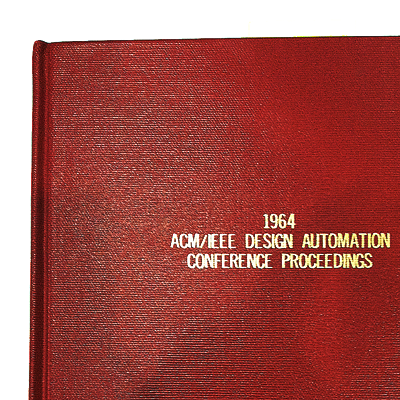 There is even a copy of the proceedings from the very first DAC – “1964 ACM/IEE Design Automation Conference” – held in Atlantic City, NJ June 24-26 1964. In browsing the table of contents of that first DAC, we see topics like “Circuit Network Analysis,” “Component Selection and Placement,” “Sketchpad,” “Automated Engineering Design”, “Wire Routing,” and others. Something like 19 papers are listed, plus introductions and wrap-ups. To give some historical perspective – this first DAC was held six months after the JFK assassination and two years before Gordon Moore’s now-famous article that marked the beginning of the semiconductor revolution. It was held when behemoth pre-IC mainframe computers were batch-programmed with punch cards. There were no graphic monitors or mouse-driven UIs. Logic design was in its infancy. FORTRAN was the standard for scientific programming. Most of the attendees at this year’s conference were not yet born. In fact, the first DAC long preceded the birth of the Electronic Design Automation (EDA) industry – the industry that now essentially owns the conference. DAC (and EDA) have played an integral role in the most amazing technological revolution in the history of mankind. From the days of the first integrated circuits to today’s systems-on-chip with billions of transistors on a device the size of a fingernail, electronic design automation has been indispensable in achieving each new level of success. Today, virtually nothing is designed without direct help from sophisticated tools. The engineering of those tools – perhaps more than the engineering of electronics systems themselves – has been responsible for the creation of the technological world we enjoy today. Wally Rhines (CEO of Mentor Graphics), in his keynote address, pointed out that – over the past few years, we have seen a 5x increase in the number of transistors on a chip, with only a 3% growth in the number of engineers designing them. That means design tools have accomplished amazing feats in boosting engineering productivity. As a trade show, DAC has gone through a tough spell over the past decade, and it shows. This year’s event has fewer exhibitors, smaller booths, and a much smaller show floor than in years past. The big three EDA companies – Synopsys, Mentor, and Cadence – still form the backbone of the show, but each of them leaves a much smaller footprint than in DAC’s glory days. More importantly, the ecosystem of startups that has traditionally fueled innovation in EDA has shrunk noticeably. The engineering attendance appeared strong, however, and Austin as a venue afforded DAC a look at many customers from the Texas tech center that would not normally attend DAC in its normal home on the West coast. It’s easy to forget – among the flashy booths, glossy demos, magicians, contests, and goofy giveaways, that DAC is not just another trade show. An uninformed visitor might look around and conclude that they were in a small- to mid-size industry event that had lost steam and was fading in importance – particularly if that same observer had attended events like the dazzling Consumer Electronics Show in Vegas. The magic of DAC, however, is in leverage. Any one of the attendees walking down the aisle could be the engineer whose spark of genius creates the Next Big Thing or provides the breakthrough that gets us past that next, seemingly-insurmountable hurdle. Or, it could be just the guy looking for a tool that could shorten his verification runs by a few days on his giant team’s next design. Unlike most trade shows, DAC is not about wooing the masses, but rather about influencing the few. A company with only ten or twenty actual customers might sport a giant, glitzy, well-staffed booth giving presentations in a theater on the hour – with top-secret suites in the back where prospects are shown the “secret stuff.” This is a big fishing net stretched across a vast sea in the hopes of trapping that one key fish – that influencer from Cisco, Apple, Qualcomm, or some other key system design house – who will validate their technology for real production use and launch their company into the ranks of real contenders. The show is as much about tradition and tribe as it is about trends and technology. The EDA industry is a closed ecosystem, and top talent regularly circulates through the long-standing companies. Ask any EDA company employee how many companies on the floor he or she has worked in before – you’re likely to hear a list of three or four. At least one will be one of the “big 3” – Synopsys, Mentor, or Cadence, and frequently the list will include at least one startup that produced some new innovative technology, secured a few initial customer wins, and then got gobbled up by one of the three Borg-ian behemoths. That’s the way things work in EDA. You strike out on your own, create your startup, and then, eventually, you get reeled back into the tribe. Every Tuesday night at DAC is the legendary Denali party. It’s an odd spectacle – a dance and music party in an industry that is predominantly composed of introverted males. Somehow, miraculously, once each year, these DAC attendees congregate in some club or concert venue and let their hair down just enough to dust off the nerd veneer and let the fun shine through. It’s a wonderful thing – so wonderful, in fact, that the party has outlived the company for which it is named. Denali was acquired by Cadence several years ago. The biggest concern among customers and competitors about the aquisiiton… “Does this mean no more Denali party?” Cadence apparently had the wisdom not to let that happen. Whether or not EDA is, as Gary Smith put it, “the most important industry in the world,” is debatable, but it is absolutely clear that the technology that the world depends on today would not exist without the incredible engineering that takes place behind the scenes in EDA. Despite that, EDA has always been an industry that has struggled to extract its fair share of the value from the electronics and semiconductor market – slogging along at less than five billion dollars in a greater industry whose value is in the trillions. Hopefully, DAC helps to preserve awareness of the importance of this industry and the technology it creates. Hopefully it inspires a new generation of engineers to explore the challenges of electronic design automation and a new generation of financiers to see the wisdom of investing in this critical area. Only time will tell. Have you ever been to DAC? Do you think trade shows and conferences are still valuable in this age? As an exhibitor, Space Codesign saw high quality in the turn-out even if the quantity of the crowd seemed smaller than at #49DAC. It has amazed a lot of people that this was the first time for DAC in Austin, where it should be every third or fourth year! As an editor, I just completed briefings with something like 17 companies who were exhibiting at DAC. The feedback I heard was very consistent with yours – they saw a high-quality audience of engineers in Austin that was distinctly different from the audience they see at conferences on the West coast. Conferences are struggling in general right now, but DAC is a gem. DAC is overblown, over heated and totally distorts the image of the industry and the marketing budgets of the companies in the industry – and I miss it dreadfully. Glad to hear it is still such a great place to meet and exchange information and trade lies.